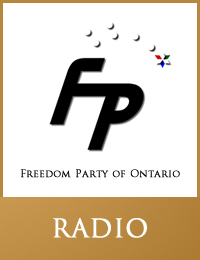 On The Tom McConnell Show (1290AM CJBK, London, Ontario and 610AM CKTB, St. Catharines, Ontario) Robert Metz, president, Freedom Party of Ontario, called in to join the discussion about the way in which political parties are funded. It was clear to Metz that most other callers held mistaken assumptions about the nature of political parties and how they are funded. Metz explained the situation at the Ontario provincial level. Metz explained that private contributors to Ontario political parties can claim a limited tax credit, meaning that they can reduce their own provincial tax payable, but only if they actually have tax payable to the province. He explained, more generally and as a matter of principle, that political parties – whether federal or provincial – are private organizations that should not receive any funding from the government (at the time, large federal parties were being paid a per vote allowance in addition to private contributions from individuals).